Natural gas commercial customers are eligible for incentives for high-efficiency boilers, furnaces, heaters, on demand water heating systems, and commercial kitchen equipment. Installing a high-efficiency system can reduce your business’s energy costs and ongoing operating expenses, leaving you more money to grow your business. If you’re starting a new business, switching to natural gas, or your current natural gas equipment is old or inefficient, it’s the right time for you to consider installing a high-efficiency unit. Businesses can save money, increase equipment reliability, and create more comfortable and productive workplaces by making energy-efficient choices when installing, upgrading, or replacing heating equipment. Incentives are currently available for high-efficiency boilers, furnaces, heaters, and controls. Find out more about incentives click here. 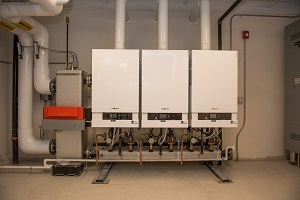 Maine businesses can reduce water heating costs by upgrading to high-efficiency, tankless, natural gas water heaters. Upgrading to tankless water heater can reduce water heating costs, save space, and provide hot water when you need it. Qualifying tankless water heaters are available with an instant discount at participating distributors. Many restaurants, schools, and hospital kitchens offer opportunities for increased energy efficiency. Examples of high-efficiency equipment include ovens, broilers, and griddles. Find out more about commercial kitchen equipment and incentives here. Work with an Efficiency Maine Qualified Partner to install high-efficiency natural gas heating, kitchen, and water heating solutions. Click here to find a Qualified Partner working near you. If you work with a contractor that is not yet a Qualified Partner, urge your contractor to find out more information here. Efficiency Maine also works with businesses on custom natural gas efficiency solutions. If you don’t see your natural gas project listed here, click here to learn more about custom efficiency incentives.